This is a review of Pfizer’s Rogaine. The manufacturer claims Rogaine regrows hair in men and women. The primary ingredient, Minoxidil, is what they claim is responsible for regrowing hair. 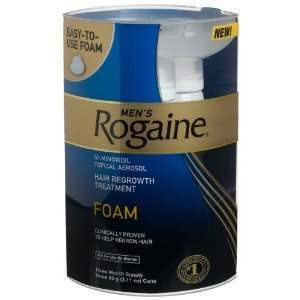 Read on for information about the ingredients, pricing, side effects of Rogaine. Minoxidil, which was initially used orally to treat high blood pressure, is the main, active ingredient in Rogaine. When used as a high blood pressure treatment, it was discovered patients grew extra hair on their bodies, prompting the testing of Minoxidil as a topical solution on balding areas of the scalp. The results were positive for the regrowth of hair. Rogaine should be applied directly to the thinning areas of hair on the scalp, and this should be done twice a day. Side effects of this topical solution are considered rare and if experiencing any of these it’s recommended to see a physician as soon as effects occur. Possible side effects include; burning, itching, or reddening of the area where Rogaine is applied. Inflammation can occur, causing pain at the hair’s roots. Swelling of the face can occur in some cases. Extremely rare side effects are; problems with vision, pain in the chest, headache, fainting or dizziness. The heartbeat can become irregular, and swelling or numbness can occur in the legs, feet, and hands. Some have reported weight gain. The website’s price for Rogaine is $59.99. There is a program you can join which gets you a fifteen percent discount when you sign up for four months of auto-delivery of the product. Rogaine for Women is refundable after twelve weeks of use, going by the directions, if no satisfactory results were experienced with the use of the product. Original receipt must be kept and the limit on amount to be refunded is sixty dollars. Rogaine Extra Strength for Men is refundable when the recipient registers either online or via a toll free phone number. This is only allowed after using the product for four months and making sure to use it according to the directions, and satisfactory results were not experienced by the user. A bit under fifty percent of users made good reviews about this product and said the results were favorable. Most would recommend the use of Rogaine. Minoxidil is the main ingredient in this product and has been proven to enhance hair growth. This product does have a guarantee from the manufacturer. A very small percentage saw no results. Some even had more balding and hair loss when using Rogaine. The remainder of reviews showed users didn’t see the effects on their hair loss they thought they would see by using this product and felt it a waste of money. The price is in the high end of similar products used to re-grow hair. John Brownstone	reviewed Pfizer Rogaine	on August 3rd	 and gave it a rating of 3.5.